Aerial photography exerts a great attraction because one can see far and wide from abird's eye view. No wonder that drones are enjoying greater popularity. What was previously only available for film and television professionals is at long last available for amateur film makers and recreational pilots. For example, the compact aerial drone Parrot that can be controlled from the iPhone or iPad has triggered a real hype. But even higher-quality and technically more complex drones with more payload such as the Phantom 2 quadrocopter are enjoying growing popularity. Aerial drones are an easy way to get beautiful shots of buildings, nature or even your own house from above. Clearly, one would like to film for this purpose and would like to share the sometimes breathtaking impressions with friends or family. Although aerial drones like the Phantom quadrocopters or the smaller Parrot are very handy, they are characterised by enormous aircraft performance. So it is quite possible for an action cam such as CamOne, Contour HD Mod1300, Contour+2, Rollei Bullet HD, Rollei Bullet S5, GoPro Hero2, GoPro Hero3, GoPro Hero3+, Sony HDR AS10/AS15 or Drift Innovations HD170 to take a great trip into the air. But it need not be an action cam that is sent to lofty heights. Your digital cameras could just as well be securely fastened, like the Panasonic LumixDMC T27 or OlympusE-PL3 and your professional video cameras, like the Canon XHA1, Canon HFG10 or Canon EOS. Even if your want to send your Samsung Galaxy S2/3 on a ride into the clouds, nothing stands in the way. However, strong vibrations are generated when lifting such loads. The drones are only able to lift the weight through high rotational speed of the rotors. This swinging and vibration distortthe image and spoil the video fun. Gimbals are one option to compensate for this. Gimbal-camera combinations for certain types of drones, such as the DJI Phantom II RTF + Zenmuse H3-2D GoPro3 Gimbal or the DJI Zenmuse H3 2D Gimbal reduce mechanical shocks, but at the same time, they cause other interference factors which may lead to irritation during video recording. The shocks, vibrations or distortions are therefore often only compensated to a minor extent. 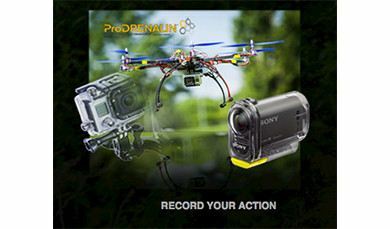 This is precisely the strength of ProDRENALIN: This proDAD software is not only used for video stabilisation but can also improve the aerial videos even further. In particular, the rolling shutter effect can be fully compensated with this software. This effect occurs especially during fast movements in the recording of the video when the drone rises or rotates quickly. Individual pixels are not correctly reproduced during these rapid movements. ProDRENALIN compensates for this completely and thus allows for perfect videos during fast movements. If you also have experience in aerial recording with drones and various action cams, we would appreciate both your feedback and your videos. Hallo, das erste Video funktioniert nicht. Ich liebe diese Luftaufnahmen. Die Perspektiven sind einfach immer schön zu sehen. Das sieht man schließlich nicht jeden Tag. Danke für die tolle Aufnahme!